ISIS propagandists who boasted on Twitter Wednesday and Thursday of the group's connections to the San Bernardino massacre tweeted claims of responsibility during the Paris onslaught and have threatened more. Law enforcement officers killed suspects Syed Rizwan Farook and his wife,Tashfeen Malik, in a shootout following their murder of 14 people at an office party for county workers, who were Farook's colleagues. Preliminary investigative work determined that Farook became radicalized and communicated with Islamists. The assault occurred on the same day an Islamic State propaganda video vowed attacks against Washington and New York. "#BringItOn CHALLENGE ACCEPTED ! !# AMERICAONFIRE WHEN WE SAY WE'LL KILL YOU IN UR COUNTRIES WE MEAN IT," ISIS supporter Alharthidz Jarallah tweeted at 1:42 p.m. on Wednesday. He later tweeted that IS "warned USA led coalition and they don't listening" [sic]. In another tweet sent at 9:14 p.m. on Wednesday, Jarallah taunted the U.S., saying: "That's what you get America don't play with us cuz you'll get burned #AmericaBurning." Another ISIS supporter, @Pashbakr1, tweeted on Wednesday at 10:15 p.m. wondering if the killers were lone jihadists, "Lone Wolf Blessed Attacks !?" On Thursday a leading ISIS propagandist who tweets under the handle Muslimah congratulated Farook and Malik for the San Bernardino assault, calling them martyrs. After law enforcement disclosed that the couple had been radicalized, she revealed that Farook had given bay'ah or allegiance to the Islamic State. "By 'Radicalized' they mean he gave bay'ah," she tweeted. She declared it a day before law enforcement revealed that Malik had posted on Facebook during the attack that she had sworn allegiance to ISIS. A mid-level ISIS commander, who variously refers to himself as Jazrawi_DAESH or Jazrawi_Oood stated that Farook and Malik were "special agents of IS" and that they murdered the innocents in "response to so called US bombing of Muslims." He previously revealed during the Paris bloodletting that ISIS had sent "Syrian refugees" to carry it out. In a manifesto released Monday, titled "Black Flags From The Islamic State," the group revealed that Paris mastermind Abdel Hamid Abaaoud entered Europe hiding among the flow of refugees and that two other Paris attackers had done likewise. 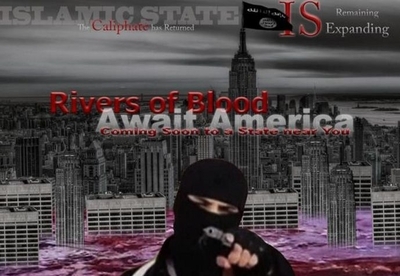 At the time of the Paris brutality, an Islamic State-connected website stated: "The American Blood Is Best and We Will Taste It Soon." "We bless the Islamic Umma for this great slaughter today. The blood of Crusaders was spilled in Paris, and tomorrow with God's will in the heart of Washington," 4Musharraf tweeted in Arabic. An ISIS-linked news website confirmed Friday that "two supporters of the Islamic State" carried out the San Bernardino rampage. Jazrawi described it Friday as "a planned attack," which an intelligence source confirmed to the Investigative Project on Terrorism on the condition of anonymity. In a tweet on Friday, ISIS supporter MagrebiWitness mocked President Obama's assertion of no credible threats against the U.S. during the holidays. "California# The Islamic State# has demonstrated its ability to strike America on its doorstep at a time in which the American Administration is saying that there is no threat of 'terrorist attacks,'" MagrebiWitness tweeted. Jazrawi warned Thursday that more assaults against the U.S. are in the pipeline. "Expect more you kuffar terrorists," he threatened. He chided Americans, saying that the U.S. was the "easiest place to go kill kuffar." "Just move to a stage that sells assault rifles guns and go target practicing in shopping mall," Jazrawi tweeted. Muslimah similarly tweeted threats of future attacks, posting an image of a masked ISIS jihadist in front of a darkened image of New York's skyline with the ISIS flag flying over the Empire State Building and the text "Rivers Of Blood Await America: Coming to at State Near You." "#Islamic State warned the US of consequences of their actions against Muslims in Syria/Iraq. #SanBernadinoShooting," Muslimah tweeted Friday, echoing Jarallah's taunt from the day of the murders. She also tweeted an image of the U.S. Capitol backed by the ISIS flag and surrounded by jihadists armed with rocket-propelled grenades. "#IslamWillDominate#SanBernadinoShooting#SanBernadino When you start war, always that chance you will lose," Muslimah tweeted in text accompanying the graphic.